MoneyAndBusiness.ca can help you save 1,000’s of dollars in Your Small Business QuickBooks Accounting Installation, Setup and Data Entry! An excellent Quickbooks System is the life-blood of your growing business and now, you can have this do exactly what you need it to do to decrease your time on accounting and increase profits by spending more time on customer service, work and marketing. 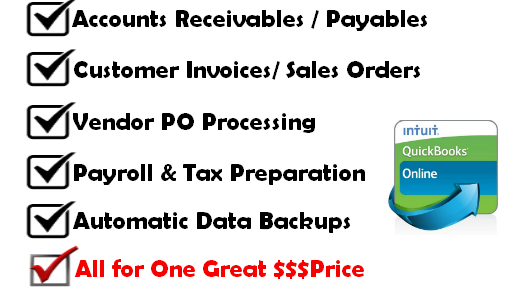 Who will benefit from this Quickbooks Data Entry Package? Business owners, entrepreneurs, consultants, marketing executives, sales people and business professionals who know that money comes from sales, marketing, and the promotion of their companies and not haggling with the intricacies of accounting. What will this Quickbooks Data Entry Package do for you? It will install, configure, and enter all transactions for any businesses in the USA or Canada, whether its sole proprietorship, LLC, Corporation, S Corporation, C Corporation, General Partnership or a Non Profit Organization. What Advantage Does Moneyandbusiness.ca offers? We know small business. For the last eight (8) years.its owners have started and operated corporations and sole proprietorship in USA and Canada, and understands the needs and operations of businesses for both countries. Accounts Receivables and Accounts Payables. This activity is the bulk of the daily accounting work to be performed. All payments made and all payments received are to be entered into the Quickbooks system. Customer Invoices / Sales Orders. The remote computers, yours or ours, are setup with Outlook or Thunderbird emailing programs to automatically and easily email out to customers an invoice or a sales order upon the placement of an order. The business owner has the option of using the same system to send estimates to prospective customers. Vendor Purchase Order Processing. Vendor Purchase orders will need to be sent and then received. POs can be sent thru the Quickbooks emailing feature using the inbuilt email feature. Payroll Services. There are monthly submission of payroll information into the Quickbooks system. There is an added option for the actual processing of the payroll by our staff. Monthly Reporting. What doesn’t get measured, doesn’t get managed. Quickbooks inbuilt memorized reports provides an excellent snapshot of the company’s financial performance. Each Quickbooks plan comes with the standard quarterly reports for income and expenses, and the annual reports for Profit and Loss, balance Sheet and Statement of Cash Flow.These annual reports can be used by an accountant to complete any tax returns. Quickbooks Data Backups. Nothing is worst that loosing all the hard earned and tediously acquired data entry files that took years to acquire. Moneyandbusiness.ca will setup your or our computers to automatically backup online all files. This ensures that in the event of a server/computer crash, the most up to date file is available for an easy retrieval and re-setup. Bank Account Reconciliations. Each monthly statement for bank accounts, Paypal accounts and merchant terminal statements will need to be entered into Quickbooks and reconciled. This is a tedious and difficult procedure for many. Toll Free Phone Support. Customer Service is located in Toronto, Canada and can be reached 9.00 Am to 5.00 PM Eastern Standard Time. Should there be a problem then we are available in your time zone and can b reached by a Toll free phone number. There are three payment options available. For businesses with monthly cashflow under $15k. US$149.00 per month. For businesses with monthly cashflow under $30k. US$224.00 per month. For businesses with monthly cashflow under $75k. US$324.00 per month.